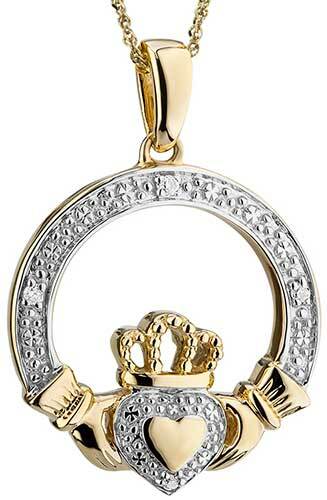 Claddagh necklace is crafted in 14K gold and features engraved white gold that is accented with 3 diamonds. This 14K gold Claddagh necklace features an engraved white gold heart border along with engraved white gold between the cuffs, that is accented with three diamonds. The diamond Claddagh necklace measures 5/8” wide x 1" tall, including the jump ring and the chain bail, and it includes an 18" long 14K yellow gold chain. 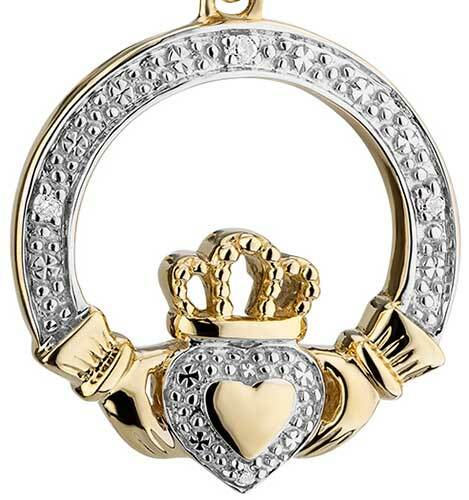 Claddagh pendant is crafted in 10K gold and features engraved white gold that is accented with 3 diamonds.